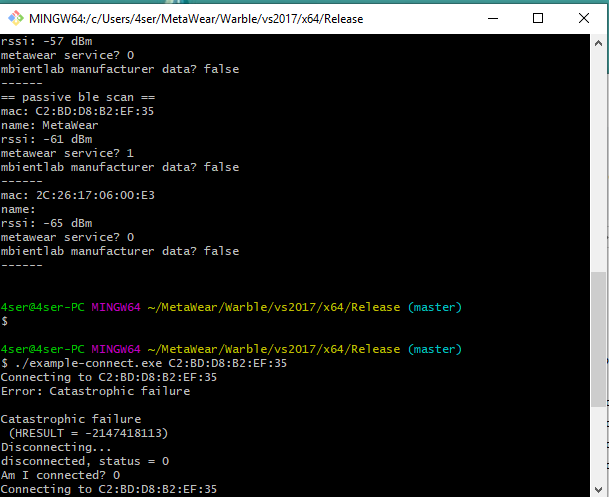 i installed "NetStandard2.0 plugins for the MetaWear C# SDK", and tried to activate the accelerometer, but nothing happens. "Unable to load DLL 'warble': The specified module could not be found. (Exception from HRESULT: 0x8007007E)"
Provide more details about the crash. Simply saying that your app crashes does not provide any information to work off of. Use the Win10 plugin if you're building a Win10 app. Your sample code is setting the odr to 2Hz. I using NetStandard cause i need the Dlls in Unity, and i cant use your Win10 app.in Unity cause Unity DOES NOT support Windows.Device.Bluetooth. Do i miss something? 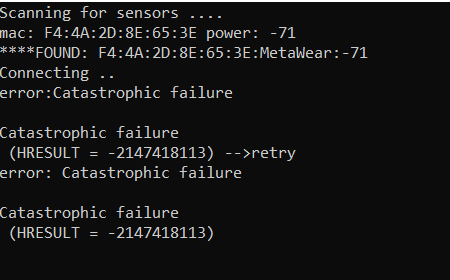 Regarding crashes: Only once in ~10 attempts, i am abling to see data coming to the sensor. All other time the app simply crashes after i press "play" . Below is a screenshot. Do i miss something ? how can i provide you more Info? I appreciate any help cause being able to get data in Unity is critical for us. As you can see - the error is " The process cannot access the file because it is being used by another process"
Is this enough info for you? 'example-connect.exe' (Win32): Loaded 'F:\Erez\Dropbox\Personal\Research2018\PLAYWORK\MBIENTLAB\Warble.CPP\vs2017\x64\Debug\example-connect.exe'. Symbols loaded. 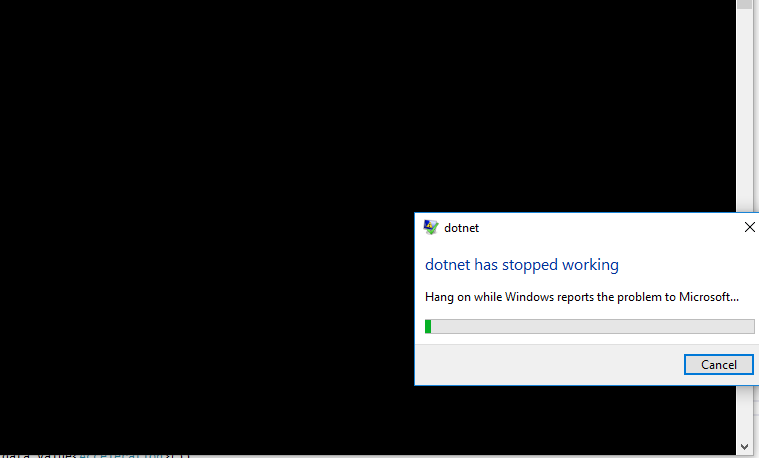 'example-connect.exe' (Win32): Loaded 'C:\Windows\System32\ntdll.dll'. Cannot find or open the PDB file. 'example-connect.exe' (Win32): Loaded 'C:\Windows\System32\kernel32.dll'. Cannot find or open the PDB file. 'example-connect.exe' (Win32): Loaded 'C:\Windows\System32\KernelBase.dll'. Cannot find or open the PDB file. 'example-connect.exe' (Win32): Loaded 'F:\Erez\Dropbox\Personal\Research2018\PLAYWORK\MBIENTLAB\Warble.CPP\vs2017\x64\Debug\warble.dll'. Symbols loaded. 'example-connect.exe' (Win32): Loaded 'C:\Windows\System32\ole32.dll'. Cannot find or open the PDB file. 'example-connect.exe' (Win32): Loaded 'C:\Windows\System32\combase.dll'. Cannot find or open the PDB file. 'example-connect.exe' (Win32): Loaded 'C:\Windows\System32\ucrtbase.dll'. Cannot find or open the PDB file. 'example-connect.exe' (Win32): Loaded 'C:\Windows\System32\rpcrt4.dll'. Cannot find or open the PDB file. 'example-connect.exe' (Win32): Loaded 'C:\Windows\System32\bcryptprimitives.dll'. Cannot find or open the PDB file. 'example-connect.exe' (Win32): Loaded 'C:\Windows\System32\gdi32.dll'. Cannot find or open the PDB file. 'example-connect.exe' (Win32): Loaded 'C:\Windows\System32\gdi32full.dll'. Cannot find or open the PDB file. 'example-connect.exe' (Win32): Loaded 'C:\Windows\System32\msvcp_win.dll'. Cannot find or open the PDB file. 'example-connect.exe' (Win32): Loaded 'C:\Windows\System32\user32.dll'. Cannot find or open the PDB file. 'example-connect.exe' (Win32): Loaded 'C:\Windows\System32\win32u.dll'. Cannot find or open the PDB file. 'example-connect.exe' (Win32): Loaded 'C:\Windows\System32\sechost.dll'. Cannot find or open the PDB file. 'example-connect.exe' (Win32): Loaded 'C:\Windows\System32\vcruntime140d.dll'. Cannot find or open the PDB file. 'example-connect.exe' (Win32): Loaded 'C:\Windows\System32\ucrtbased.dll'. Cannot find or open the PDB file. 'example-connect.exe' (Win32): Loaded 'C:\Windows\System32\vccorlib140d.dll'. Cannot find or open the PDB file. 'example-connect.exe' (Win32): Loaded 'C:\Windows\System32\oleaut32.dll'. Cannot find or open the PDB file. 'example-connect.exe' (Win32): Loaded 'C:\Windows\System32\msvcp140d.dll'. Cannot find or open the PDB file. 'example-connect.exe' (Win32): Loaded 'C:\Windows\System32\imm32.dll'. Cannot find or open the PDB file. 'example-connect.exe' (Win32): Loaded 'C:\Windows\System32\kernel.appcore.dll'. Cannot find or open the PDB file. 'example-connect.exe' (Win32): Loaded 'C:\Windows\System32\msvcrt.dll'. Cannot find or open the PDB file. 'example-connect.exe' (Win32): Loaded 'C:\Windows\System32\clbcatq.dll'. Cannot find or open the PDB file. 'example-connect.exe' (Win32): Loaded 'C:\Windows\System32\Windows.Devices.Bluetooth.dll'. Cannot find or open the PDB file. 'example-connect.exe' (Win32): Loaded 'C:\Windows\System32\cfgmgr32.dll'. Cannot find or open the PDB file. 'example-connect.exe' (Win32): Loaded 'C:\Windows\System32\ws2_32.dll'. Cannot find or open the PDB file. 'example-connect.exe' (Win32): Loaded 'C:\Windows\System32\Windows.Networking.dll'. Cannot find or open the PDB file. 'example-connect.exe' (Win32): Loaded 'C:\Windows\System32\Windows.Networking.HostName.dll'. Cannot find or open the PDB file. 'example-connect.exe' (Win32): Loaded 'C:\Windows\System32\biwinrt.dll'. Cannot find or open the PDB file. 'example-connect.exe' (Win32): Loaded 'C:\Windows\System32\WinTypes.dll'. Cannot find or open the PDB file. 'example-connect.exe' (Win32): Loaded 'C:\Windows\System32\Windows.Networking.Connectivity.dll'. Cannot find or open the PDB file. 'example-connect.exe' (Win32): Loaded 'C:\Windows\System32\FirewallAPI.dll'. Cannot find or open the PDB file. 'example-connect.exe' (Win32): Loaded 'C:\Windows\System32\fwbase.dll'. Cannot find or open the PDB file. 'example-connect.exe' (Win32): Loaded 'C:\Windows\System32\SHCore.dll'. Cannot find or open the PDB file. 'example-connect.exe' (Win32): Loaded 'C:\Windows\System32\Windows.Devices.Enumeration.dll'. Cannot find or open the PDB file. 'example-connect.exe' (Win32): Loaded 'C:\Windows\System32\deviceassociation.dll'. Cannot find or open the PDB file. 'example-connect.exe' (Win32): Loaded 'C:\Windows\System32\propsys.dll'. Cannot find or open the PDB file. 'example-connect.exe' (Win32): Loaded 'C:\Windows\System32\Microsoft.Bluetooth.Proxy.dll'. Cannot find or open the PDB file. onecoreuap\drivers\wdm\bluetooth\user\winrt\gatt\gattdeviceservice.cpp(1291)\Windows.Devices.Bluetooth.dll!00007FFEB81CE481: (caller: 00007FFEB81CDC0E) Exception(1) tid(1564) 80070020 The process cannot access the file because it is being used by another process. onecoreuap\drivers\wdm\bluetooth\user\winrt\gatt\gattdeviceservice.cpp(1102)\Windows.Devices.Bluetooth.dll!00007FFEB827EFA0: (caller: 00007FFEB81D0490) ReturnHr(1) tid(1564) 80070020 The process cannot access the file because it is being used by another process. Msg:[onecoreuap\drivers\wdm\bluetooth\user\winrt\gatt\gattdeviceservice.cpp(1291)\Windows.Devices.Bluetooth.dll!00007FFEB81CE481: (caller: 00007FFEB81CDC0E) Exception(1) tid(1564) 80070020 The process cannot access the file because it is being used by another process. onecoreuap\drivers\wdm\bluetooth\user\winrt\gatt\gattdeviceservice.cpp(1750)\Windows.Devices.Bluetooth.dll!00007FFEB81D04B2: (caller: 00007FFEB81D4B42) Exception(2) tid(1564) 80070020 The process cannot access the file because it is being used by another process. onecoreuap\drivers\wdm\bluetooth\user\winrt\gatt\gattdeviceservice.cpp(1868)\Windows.Devices.Bluetooth.dll!00007FFEB827F6E8: (caller: 00007FFEB81D4B42) ReturnHr(2) tid(1564) 80070020 The process cannot access the file because it is being used by another process. onecoreuap\drivers\wdm\bluetooth\user\winrt\gatt\gattdeviceservice.cpp(795)\Windows.Devices.Bluetooth.dll!00007FFEB81D4B61: (caller: 00007FFEB81D6A6A) ReturnHr(3) tid(1564) 80070020 The process cannot access the file because it is being used by another process. Exception thrown at 0x00007FFEEE1C4008 in example-connect.exe: Microsoft C++ exception: wil::ResultException at memory location 0x000000A4B09FDBE0. Exception thrown at 0x00007FFEEE1C4008 in example-connect.exe: Microsoft C++ exception: [rethrow] at memory location 0x0000000000000000. Exception thrown at 0x00007FFEEE1C4008 in example-connect.exe: Microsoft C++ exception: wil::ResultException at memory location 0x000000A4B09FDD80. Exception thrown at 0x00007FFEEE1C4008 (KernelBase.dll) in example-connect.exe: WinRT originate error - 0x80070020 : 'The process cannot access the file because it is being used by another process.'. Exception thrown at 0x00007FFEEE1C4008 in example-connect.exe: Microsoft C++ exception: Platform::COMException ^ at memory location 0x000000A4B0AFD970. BTW, i have Windows 10 OS, with CSR CSR8510 A10 Dongle connected. Which line of code is causing the exception? Your screen shot doesn't show me anything other than that the std::exception class is working as described. What are the steps to reproduce this exception? I have not run into this specific exception when testing on my machine. The underlying code is not doing anything fancy, just calling the Windows BLE functions. 1. 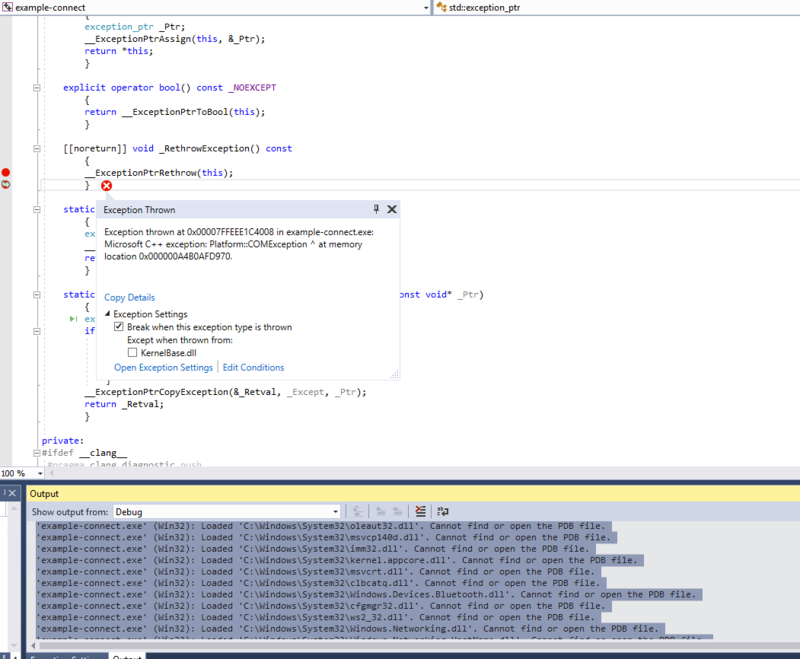 The lines of code are (i think) 209-210 at the win10_api.cpp. I used the example-connect test project to repreduce the error- i sent the mac as parameter and run it few times. As you can see in video , sometimes its ok , and sometimes crashes. Regarding your video, I am unable reproduce the error by continually running the example program in VS2017 as you do in the video. It could be something with your adapter or Windows install but it is not affecting my machine. Do you have other Windows 10 machines and/or adapters you can test with? 1.what about my trace i put? Which console app project are you referring to? You have been able to run the example C projects so you should already have the required DLLs installed. I pushed some changes to the C library, give them a try. 2. I published the app in a self-contained folder, and run it on "clean" win 10 computer (without SDKs installed) , and get the error. you can download the publish folder it here , just double-click the "console1.exe" Note that i manually put the warble.dll at the exe folder. I assume the app is looking for some dependencies? I do not understand why the first thing you do is call DisconnectAsync since the device is not connected. Furthermore, you are never stopping the sensors, so you are leaving them continually attempting to stream data upon app termination. I'm not sure what's wrong with your project but I highly doubt it is the native dll; you can check this by running the example C++ projects on your other machine. Those missing dlls in your screenshot are just shims that get resolved to another dll by Windows so they don't exist anyways. 1. I cant connect to MetamotionR two times in a raw: i running the code below - i fixed the disconnect method upon your comment , and now (i think) i disconnect it properly . 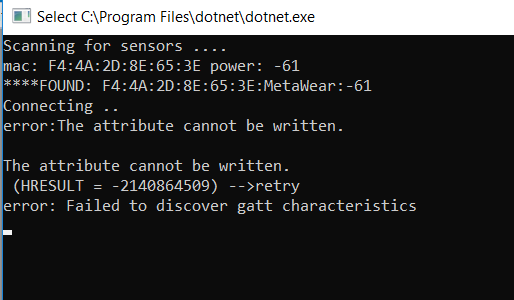 However, the second time i running the code i get exception "error: Failed to discover gatt characteristics". (see figure below - This comes from the C library you published at 21.6) . Please let me know if this code is OK. Should i wait some time after disconnect? do i miss something ? Also, my MetamotionR cannot be discovered any more even from MetaBAse app (please see figure below - it is "disconnected", however, i can connect it with code) . For example - Yesterday all day i couldn't discover it even with nRF sniffer, and today i could discover it ( only in code) . Do i miss something ? Will you have Unity SDK ( a whole package, not just DLLs) ? await barometer.Pressure.AddRouteAsync(source => source.Stream(data => Console.WriteLine("Pressure (Pa) = "
Add some code that retries ``InitializeAsync`. Do you see the same error if you are directly using the C code? I've never seen that behavior before. I have encountered times where Windows will keep the connection open, but in those cases, you cannot reconnect to the board as well until you restart the BT adapter. On Windows, the best bet is to use the disconnect method from the IDebug interface, which it looks like you are already doing. Also, please wrap your posted code with code tags so it is rendered correctly on the forums. 1. level 1 - "example-connect" in Warble (with latest commits) with success. 2. level 2 - "Example.Connect" (the WRAPPER) with success. 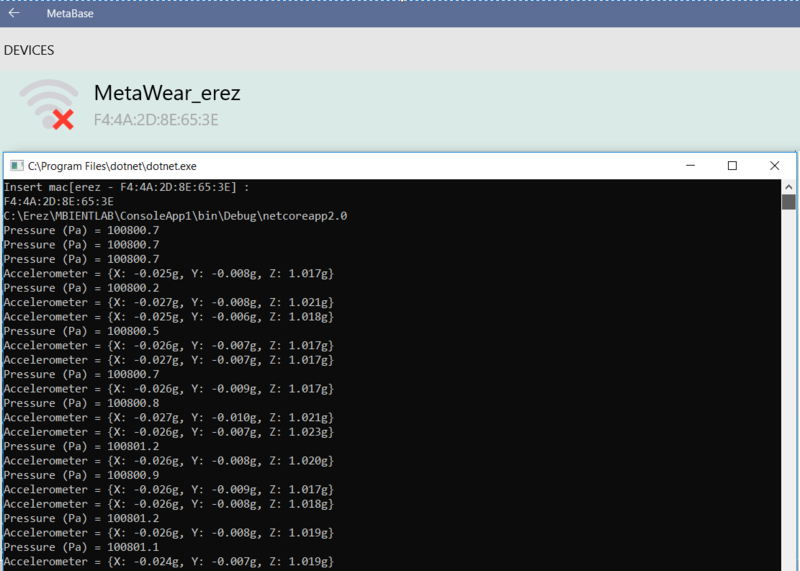 3. level 3 - testing MetaWear.NetStandard using "InitializeAsync" and "disconnectAsync" (even without strating the sensors) . Here we found some issues : in short, we cannot achieve two success "InitializeAsync" and "disconnectAsync" connections is a raw. Sometimes even the first InitializeAsync throw the exception "Failed to discover gatt characteristics" . So, i tried to do something different : this time i first call InitializeAsync , and on the second time i tried to connect to the C++ Gatt connect, but it still throws the exception. I attach the tester i used. Below is the code. You can see that i first call to InitializeAsync and then to the Gatt and always get exception. Also - maybe this bug is related to the other bug we have and described [here] on parallel post ? Running this code in a loop is my goal, so i can be sure it is working. Regarding Unity - i didnt mean to use it as repository : It seems that Unity integration is very common use of your platform. i can see a lot of people here raising the same problems that we have with Unity (the second freeze, connecting with warble, and interfacing with Android ). Do you plan to release a unity debugged package ? i tried to put code tags before and after my code without success. can you please explain how to do it correctly ? I pushed out some fixes to the NetStandard plugin; the new version (v1.0.5) works with your attached solution on my machine. 2. Is there a way to subscribe to your commits? This error was due to firmware update to 1.4.1. somehow i had to update five times until until it was connected. How can i "wake" the sensor ? i tried to move it and restarting several times, but nothing works.. Same error here. Catastrophic failure. I'm on 1.4.1. Hrm, I don't have any issues with your updated VS solution nor the sample C programs. My test board is also running firmware v1.4.1. There weren't many code changes in the latest release, just commits ee4230b. and 8f3b726. Maybe your adapter does not work with uncached service discovery (first commit)? Since you are working with the source code, which line is causing the exception? You can follow the project on GitHub. Try unpairing your sensor under Bluetooth settings in windows 10 and try connecting again. That did the trick for me. I never pairing with windows 10 , i am using the Scan method of the Warble. This plugin implements the IBluetoothLeGatt and ILibraryIO interfaces for .NET Standard2.0 compatible applications. Developers buidling Windows 10 specific applications should use the Windows 10 plugin instead. Linux users will also need to compile the Warble library on their target machine and ensure that the shared library is discoverable by the dotnet application. Call Application.GetMetaWearBoard with the MAC address of the device you are communicating with. You can use the SDK features, as outlined in the SDK developers' guide, with the returned IMetaWearBoard object. Try this one. Hope it helps. Courtesy of github.